If you are over 18 you can register your consent to be an organ and/or tissue donor at any time by visiting on of our Drayden Registry locations. The first priority of health care professionals is to save lives. Your choice to be a donor does not affect the quality of life-saving medical care you receive. Everyone has the potential to be an organ and/or tissue donor, however, you must be at lest 18 to register your consent to donate. There will never be a cost to your family estate if you choose to donate your organs or tissues. Organ and tissue recovery will only happen after every effort has been made to save your life. 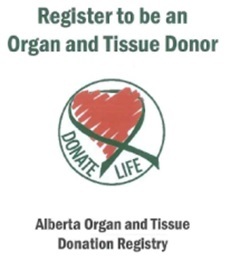 More than 45,000 Canadians, including more than 500 Albertans are on the wait list for an organ transplant. It is important to share your organ donation wishes with your loved ones as they are given the final decision. If you would like more information please go to Alberta My Health.